In a large bowl, combine the cake mix, 2 of the eggs and canola oil, mixing together the ingredients with a wooden spoon. Lightly spray a 9 x 13 in. baking pan with cooking spray. Press more than half of dough into pan, reserving the leftover dough for later. Press with fingers to evenly distribute. Bake for 10 minutes, set aside. Beat together the remaining egg, cream cheese, sugar and vanilla until light and fluffy. Spoon over the baked crust and spread evenly to cover the entire crust. Top with sliced strawberries. Take remaining dough and drop by the tablespoon over strawberries. Return to oven and bake for 20-25 minutes. Remove from the oven and cool completely. Chill in the refrigerator 2 hours. Substitute sliced strawberries with blueberries, blackberries or a berry mix. This sweet treat combines two of my favorite desserts – cake and cheesecake! 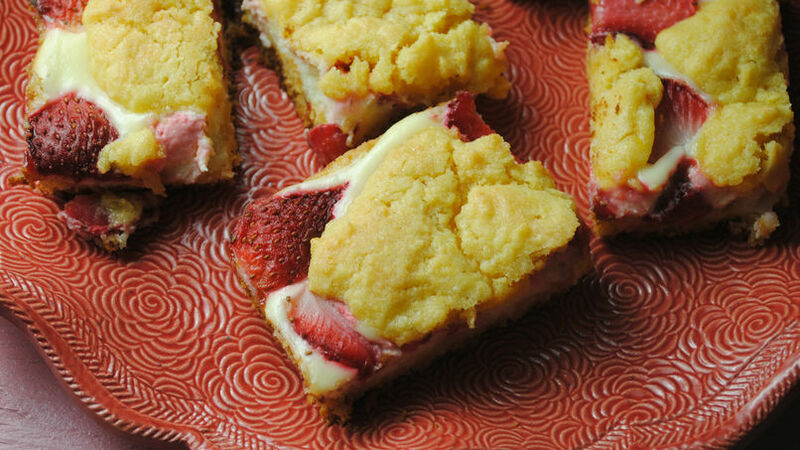 With a rich cake crust and a layer of strawberry cheesecake, topped with even more cakey goodness, I'd make a double batch if I were you! These bars will be gobbled up in no time!